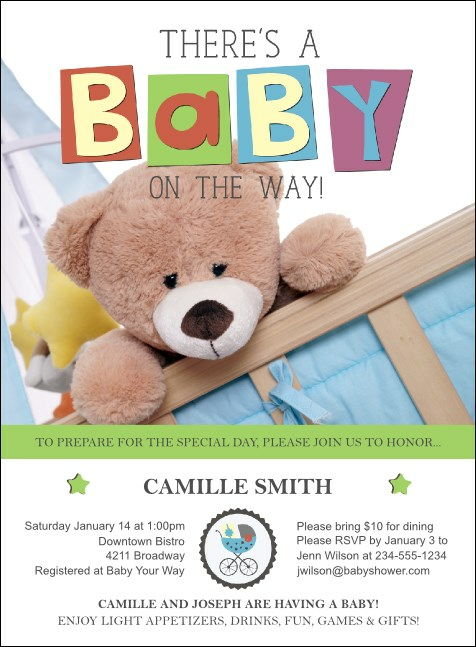 The bounty of a new baby beams forth from the Baby Shower Teddy Invitation. Pleasing proposed guests and honorees will be a snap with ethereal hues in red, purple, green, blue and yellow. The gentle gaze of the fluffy stuffed animal as he looks out from his bassinet transmits a friendly cheer to all. Edit 12 fresh lines on the template below to give your visitors all the info they need. Enjoy event planning with the right invitation from TicketPrinting.com!